Description: 61N spotted ou the outskirts of Chattanooga. Description: CP 8753 leads a short train of hoppers and tank cars for the CP yard in chatham before heading back westbound light power. Description: CP Gevo 8753 passes through the plant at CP88 heading to the River tracks with train 38T, we also heard him call himself "The Daylight Changer"
Title: CP 8753, CP's Tomah Sub. 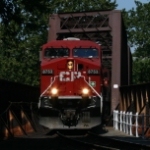 Description: Right at sunset, CP Train 612-220 rolls through Birmingham Jct. with 66 loads of crude oil from Harvey, ND for KCS at Kansas City, bound for Port Arthur, TX. This is the first move of its kind. Description: Approaching North County Line Road, CP 8753 hustles the oil loads of train 550 east into Cone.